The GC 2.0 stream included one to two questions posted weekly for four weeks in the DMCPI GCConnex group, with over 28 unique respondents from a wide-array of departments. This allowed us to build on the work that had already been done for the Virtual Policy Challenge, creating continuity. It also allowed us to target individuals who have a self-identified interest in the work of the Committee, public policy development, and are likely tech-savvy and familiar with many sharing economy platforms. Over the course of November 2014 to January 2015, lunch and learn sessions on the sharing economy were held in the national offices of eight different federal departments. Departments were chosen based on their interest for the topic and/or the existing linkages between their respective mandate and the sharing economy. More than 225 public servants from all levels participated in these events. Each Lunch and Learn session began with a five minute “ignite-style” presentation aimed at raising awareness on the sharing economy followed by an open and informal discussion on the issue and its implications for Canada. Throughout most of the events, public servants were asked to share their views by using their personal mobile devices to respond to specific polling questions (see Annex B for full poll results). In all our engagement sessions, participants’ enthusiasm for the subject matter was evident. Both practitioners and public servants had insightful observations on the sharing economy and were willing to candidly express their views. Throught most discussions, participants commented on the drivers of the sharing economy, as well as forces which could slow down this fast-rising trend. Governments could enable and provide support for innovative sharing economy businesses (e.g. ride-sharing & tool libraries). This could include assisting new businesses in navigating regulatory frameworks and providing seed funding to innovative companies that aim to solve public problems. Governments could use their legislative, regulatory and taxation powers to respond to the disruption created by the sharing economy (e.g. respond to health and safety concerns, loss of privacy issues, re-examine subsidies to existing industries, etc.). Governments could undertake research onvarious aspects ofthe sharing economy. This could include: who and how many individuals are accessing the sharing economy in Canada; the interconnections between the sharing economy and other disruptive innovations such as big data and the internet of things; and the economic impact of the sharing economy. Governments could seek to mitigate the negative impacts created by sharing economy companies. This could involve supporting the transition of workers involved in traditional industries disrupted by the sharing economy. Governments could seek to enhance the positive impacts created by sharing economy companies. This could involve incorporating sharing and the social connections it spawns into various activities (e.g. emergency preparedness). Governments could play a convener role. Understanding the sharing economy and responding to the risks and opportunities it entails will likely require horizontal approaches and involve a variety of stakeholders. "An acceleration of sharing economy approaches increasingly unmatched by government responsiveness creates room for continuous tax and regulation evasion"
Participants from the engagement sessions also identified specific sectors and possible actions governments could take related to the sharing economy. One of the most popular areas where participants identified actions governments could take was within the economic, social and labour sectors. Some of the main themes identified were around the changing reliance on social assistance programs and their funding - an area with implications for disadvantaged populations and labour and human rights. As the sharing economy continues to disrupt the labour market, the social security net (including Old Age Security, Employment Insurance, etc.) may need to be redesigned to ensure it meets the needs of sharing economy workers. Governments should recognize the interconnected risk between the sharing economy, tax revenue and social services; with unreported income and the erosion of traditional jobs, the ability to provide social assistance will be affected at a time where they will be increasingly needed. Government needs to avoid picking “winners” and “losers” - particularly where the losers are the industry monopolies. Government could play a role in supporting industry transition in areas where the sharing economy will have significant negative impacts on industry incumbents (particularly with SMEs). Governments could provide education, insurance and other resources designed to meet the needs of the growing number of sharing economy contract workers and freelancers. At a policy level, governments will have to determine which labour standards and labour codes to apply to workers operating in the sharing economy. Over-regulation of the sharing economy could impede the growth of these informal markets which create value for disadvantaged groups (e.g. low income, new immigrants). Governments will have to decide how to enforce human and charter rights and supporting legislation to ensure the sharing economy does not disadvantage particular groups of people. Privacy, health and safety concerns were also raised through the engagement sessions. Participants were particularly about the health and safety of sharing economy workers and users. It will be increasingly important for governments to preserve labour laws and health and safety codes in light of a shift towards sharing economy models. To alleviate concerns about safety, governments could “validate” private sharing economy platforms through such criteria as criminal record checks. Governments may need to expend additional resources to be able to ensure the enforcement of rules and regulations given the shift from a few large traditional players to many “prosumers”. There will be increasing expectations on governments to ensure that the sharing economy respects privacy laws for citizens. The environment and government operations were also areas where participants saw potential government intervention. They felt that governments could potentially find cost savings through making use of sharing economy companies. Governments could look to proven sharing economy models to meet their sustainability and environmental goals. For example, incentivizing the sharing of energy produced by decentralized renewable energy providers, and ride-sharing. Governments could establish civic crowdfunding platforms and campaigns. Governments could create a micro-tasking platform for government jobs. Governments could save money by making use of lower-cost car, ride and accommodation sharing when traveling locally, nationally and internationally. The implications of the sharing economy for the Government of Canada are numerous, fast-changing, and far-reaching. The list of possible actions that follow may provide a useful inception point for further study. They are meant to be illustrative, not exhaustive, and are not prioritized in order of importance. Possible action: Undertake research to better understand the sharing economy and its implications (e.g. social, economic, environmental) and use standardized methods for assessing its impact on federally regulated industries. For example: The Government could work to measure the size and the economic impact of the sharing economy in Canada. Possible action: Examine federal government policies, rules, regulations and codes to ensure they remain relevant and reflect the changing nature of the way goods and services are produced and consumed. For example, the Government could explore updating its definitions of traditional labour market concepts (e.g. full time employment, unemployment, part time employment), as well as the way it calculates its labour market statistics. Possible action: Develop a clear definition of the sharing economy, which may include a statement on the federal government’s vision for the sharing economy in Canada. Possible action: Clarify tax, legal responsibilities and standards for people participating in sharing economy models (both as consumers and producers), as well as for businesses operating in the sharing economy space, to ensure fairness. For example, with regards to people (including people-as-business), the Government could create a guide to taxation in the sharing economy, and an online tax calculator to help users of the sharing economy navigate their taxes with ease. encourage sharing economy businesses to self-organize in order to speak with one voice on common concerns, as well as set benchmarks and standards of service (e.g. respecting users' data privacy, dispute resolution service). Possible action: Seek to proactively expand the positive impacts created by the sharing economy while mitigating its negative effects. use the sharing economy to support integration of new immigrants and ensure new Canadians have access to commodities and communities they need. Possible action: Explore opportunities to work with provinces, territories and municipalities to develop an overarching frame-work that could serve as a guide or bench-mark for regulating the sharing economy. For example, the Government could: work in partnership with provinces and territories to assess the impact of the sharing economy on the way training and education credentials in Canada are measured and evaluated. Possible action: Explore opportunities to work with sharing economy groups to leverage public good. For example: work in partnership with sharing economy companies to strengthen Canada’s emergency response and recovery in time of disasters. Possible action: Embrace the opportunities offered by the sharing economy to make its own operations more efficient and help achieve its policy goals. create or identify a cross-departmental, multidisciplinary hub responsible for applying policy innovation tools and approaches to better understand and coordinate the federal response to the sharing economy. A snapshot of how peer-to-peer platforms are rapidly expanding who is “sharing” and what is being “shared”. According to the Mesh Index, there are more than 9,000 startups in this space. Examples noted with (*) are Canadian-based. This annex contains supplementary information to be read as a complement to Part 2 of the report - Summary of Engagement. In an effort to maintain the distinct character of each event, the following summaries are provided in various formats. Vancouver - Participants in Vancouver conversations were keen to point out that sharing and collaborative consumption are not new. This is particularly true in Vancouver, which, along with other north west coastal cities, is considered by Shareable.net to be at the forefront of the sharing economy movement. Participants referenced public libraries that have existed for centuries, and borrowing and bartering from friends and neighbours. All participants highlighted the same intangibles behind the sharing economy: trust, relationship, sustainability, proximity and ease of access. Technology-assists such as smartphone apps, websites, etc. have made sharing and collaborative consumption easier, faster and less complex, thus fueling broad and fast expansion of the sharing economy. One participant noted that the Vancouver Tool Library allows users to look online to check availability and reserve tools for pick-up later. This kind of platform is more effective at promoting sharing because you can guarantee what people want: access. Participants also highlighted the affordability gains to be had through sharing (accessing) rather than purchasing (owning). In addition, several sources noted that the City of Vancouver is interested in how sharing economy activities can help contribute to local sustainability goals (such as the city’s aim to be the greenest city in the world by 2020) by reducing consumption, waste and emissions. The sharing economy can also contribute to a more resilient city through the leveraging of social connections in times of emergency preparedness and response. The Sharing Project is the first research project in Canada to measure and report on people’s interest in the sharing economy at a municipal scale. The primary goals were to understand Vancouverites’ attitudes toward sharing, to measure the demand for shared assets in the city, and to highlight opportunities for growth within the sharing economy. The Sharing Project contextualized the sharing economy as part of the everyday, noting that the vast majority of Vancouverites participate in “traditional” sharing activities - they borrow and barter with neighbours, take books out of the library, etc. The Sharing Project has now morphed into Share Vancouver, an organization that focuses on working with communities and organizations to start new sharing initiatives, build understanding of the sharing economy, and build the network for Vancouver’s sharing organizations. Cohousing is a type of collaborative housing in which residents participate in the design and operation of a micro-neighbourhood (typically no more than 35 homes) that includes substantial shared amenities. Vancouver Cohousing is a 31-unit housing development located at 1733 E 33rd Ave. in Vancouver, BC. The development includes over 6000 square feet of common amenity space including office space, guest rooms, a multipurpose room, shared laundry, a children’s play room, a music room, workshop, bike maintenance room, etc. The usual process of building multi-family housing developments sees a developer purchase the land, rezone it, develop it and then sell it at a profit. In the case of Vancouver Cohousing, the members and future residents planned, designed and financed the project which intentionally has no profit. Future Vancouver Cohousing residents, as with other cohousing residents globally, expect to contribute to each others lives in tangible ways such as helping with elder and child care, shared meals, etc. Governments should provide a stabilizing role to ensure that the negative effects of the sharing economy (such as over self-regulation through hyper-accountability, loss of privacy, loss of data due to bankruptcy) are lessened. Position sharing economy “advocates” within government to help ease the transition for new businesses, and use emerging model for internal services (e.g. government travel). On startups versus established sharing economy companies... Sharing economy companies can be seen as ‘incubators’ for bigger players, as start-ups tend to take bigger risks, be nimbler, etc. On IT challenges... A challenge for Canadian start-ups wishing to create and operate IT sharing economy platforms is the unavailability of IT expertise to match the current demand. Triple in 3 Years - The value of the crowdfunding economy has more than tripled in 3 years: $1.5B in 2011 to $5.1B in 2013 http://blog.clarity.fm/clarity-exclusive-crowdfundings-epic-infographic/(Clarity, no date). 45% Willing - 45% of Canadians are willing to rent their stuff from others. Similarly, 42% are willing to rent from others. 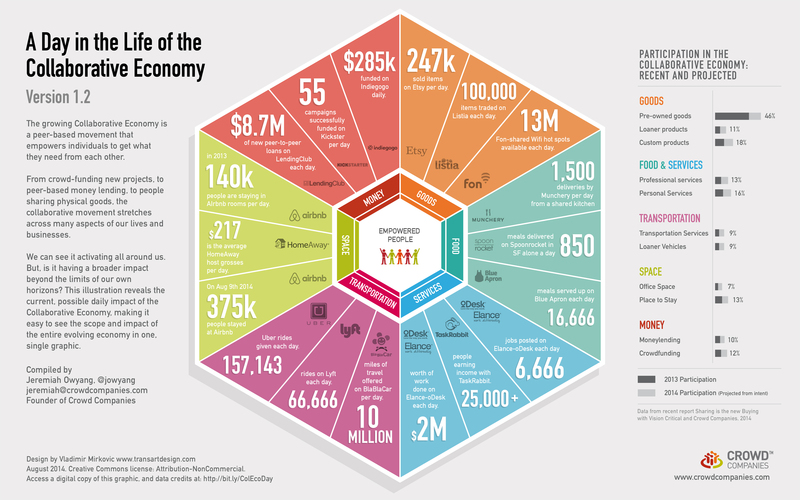 http://strategyonline.ca/2014/06/02/canadians-open-to-a-sharing-economy-study/#ixzz3NJlRmlsQ (Strategyonline.ca, June 2, 2014; numbers reference a global Nielson study). Calgary, Halifax and Ottawa) now share over 5,000 tools at their local tool library. Sarah Chan (@schancase) is a policy analyst and project lead with IN.spire, Natural Resource Canada’s Innovation Hub. When not working on policy and community projects in Ottawa, she and her husband can be found building a straw bale cabin in Cape Breton. Sarah holds an MA in public policy and international affairs from the University of Ottawa. Marie-Eve Desrochers (@medes83) is a senior economist for the Department of Finance, working on Multilateral Development Banks. She is a volunteer for the Quebec Economist Association and the Government of Canada Advanced Analyst Policy Program. Her interest include politics, travel and music. Marie-Eve holds an MA from the University of Western Ontario. Erin Gee (@erin_gee) is a policy analyst for the Canada Revenue Agency, working in the Accelerated Business Solutions Lab. Her interests include #policyinnovation, behavioural economics, and civic engagement. She is the founder of TEDxElginSt, and writes for Startup Canada, Herd Magazine, and many other publications. Dan Monafu (@danutfm) is a policy analyst for the Public Health Agency of Canada and works in the #policyinnovation space. He is the co-founder of Soup Ottawa, a participatory micro-grant dinner event held seasonally, and Ottawa (de) tours, a critical-thinking walking seminar initiative. Dan holds an MA from Carleton University’s Norman Paterson School of International Affairs (NPSIA). Kent Aitken (@kentdaitken) works on outreach and engagement for the Government of Canada’s Open Government program. He writes about public service renewal at cpsrenewal.ca, runs Musical Underground Ottawa, and works with various organizations that try to bridge the gap between government and citizens. Kent led the GCConnex engagement stream for DMCPI+. Ericka Stephens-Rennie (@erickasr) is an analyst with Environment Canada in Vancouver, BC. She is the co-founder and operations manager of Vancouver Cohousing (see page 35). Ericka holds an MA in public policy from the University of Toronto. Ericka provided comprehensive report edits and led the Vancouver component of our City Stream outreach. DMCPI+ would also like to acknowledge the following individuals: Val Thomas for the cover image, and everyone who helped us with our external engagement sessions, including: Nick Charney, Chris Diplock, Ryan Dyment, Lucy Gao, Meghan Hellstern, Bronwyn Oatley, and Christine Renaud. Prosumers are defined as individuals who are both consumers and producers. Rachel Botsman is a global thought leader on the power of digitally-enabled sharing and the author of the 2010 book “What’s Mine is Yours: How Collaborative Consumption is Changing the Way We Live”. In June 2014, the city changed its parking bylaw to allow shared cars to park on city streets in any neighbourhood without street permits for free. Montreal indicates that Uber does not comply with the Quebec Transportation Committee's laws, while Ottawa says it contravenes city by-laws.